The creator of ‘Marbles: Mania, Depression, Michelangelo, and Me’ discusses her latest project, which is out now from Fantagraphics. Ellen Forney has made many comics over the years that were collected in the books I Love Led Zeppelin and I Was 7 in ’75. She collaborated on the National Book Award winning novel The Absolutely True Diary of a Part-Time Indian. Forney curated the traveling exhibition Graphic Medicine: Ill-Conceived & Well-Drawn. Most readers though know her for her book Marbles: Mania, Depression, Michelangelo, and Me. Marbles was a stunning book. Both a personal story of her bipolar diagnosis, Forney also investigated the many myths around art and artists and how she has considered and lived with them in her own life. 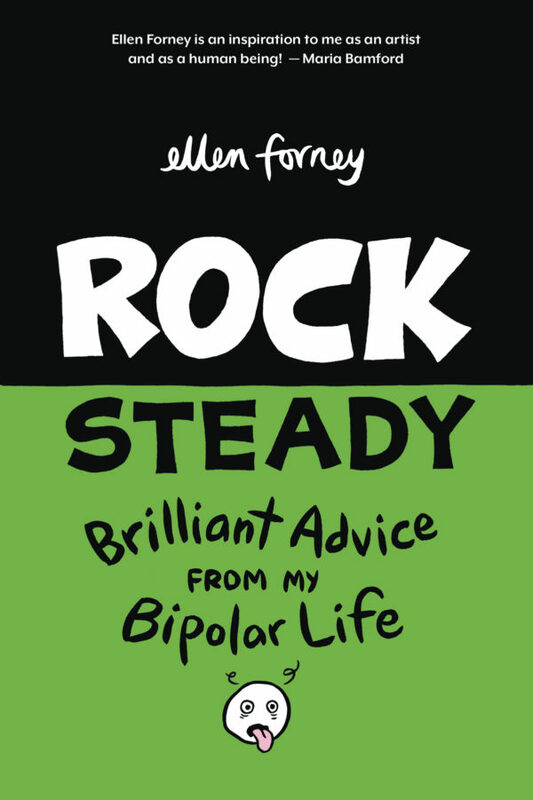 Her new book Rock Steady: Brilliant Advice From My Bipolar Life, which has just been published by Fantagraphics, is a self help guide designed to help people dealing with anxiety, depression and other disorders. It is beautifully drawn, thoughtfully written, and provides a great deal of insight into these issues. 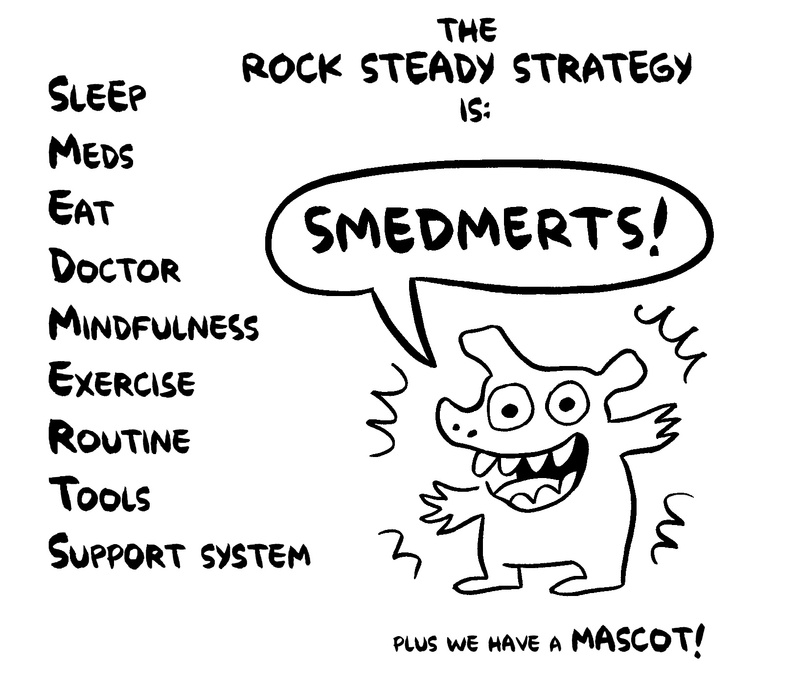 She also created a helpful and hilarious mascot to help readers, Smedmerts! Forney is on book tour right now. She’ll be at Vroman’s Bookstore in Pasadena with Maria Bamford on Friday night before going to the East coast next week. I spoke with her at home before she left about the book and her work. Where did the book Rock Steady start? Marbles took so much effort emotionally and physically. When I was done I was, I don’t want to make another memoir, I don’t want to do anything about mental illness. But in time I got a lot of e-mails from people who found it really helpful and also a number who said that they used it like a manual. It was important for me in Marbles to get a lot of information and coping tools in there, but I had so many more that I would have loved to share that didn’t fit. I figured out or found out a lot more since I put Marbles together. Putting together a manual made sense. I feel like I became a mental health activist and advocate just by putting out my personal story. It made me feel really purposeful. It wasn’t just about me and exposing my own vulnerability and strength and story, but that there was more meaning to it than just my personal story. Much more than I had realized. I wanted to do more. The focus in Marbles, and the focus in most personal stories about mental health or bipolar disorder certainly, are about the struggle to get stable. That’s what my story was and that’s the narrative story arc. That makes sense, but being healthy with a chronic disorder means that you have your whole life stretching in front of you. It’s a long term prospect and that’s not nearly as interesting a narrative. I wanted to come up with a way that was dynamic and helpful and dealt with that part of it. That’s why Rock Steady is more of a companion book to Marbles, but you can also call it a sequel in that it’s about act two, three, and four, and however long life is. Marbles is this very personal book, it’s about your diagnosis and what it means. Rock Steady is less personal, but I kept thinking that it is the map of your journey. That’s an interesting way to put it, a map of the journey. In my book I Love Led Zeppelin there’s a whole chapter on how to do different things. How to tip your waiter. How to smoke pot and stay out of jail. I’m a teacher and I like to help teach things and learn things and I think that the medium of comics is a really great way to get information across that’s otherwise really dry in text. I wanted to use the medium that I have been working in for my whole professional life to help disseminate this kind of information for people who might not otherwise be interested in either seeking it or reading it. For me the puzzle of how to take dry information and make it engaging is an interesting one. It makes me feel like I have a like I have something to share, not just the information but using the medium of comics to share it. One aspect of Rock Steady that really jumped out at me is the fact that so much of this information does not lend itself to visual interpretation. That seemed to be your big challenge with this book. Thank you for recognizing that. It was a big challenge. Being a cartoonist and doing those how to’s for years helped me problem solve and ask, how am I going to get this information across? Sometimes I’m going to make it look like it’s on a scroll of paper or I’m going to make this a dialogue. Sometimes it’s I’m going to make this into a visual metaphor – which is a really powerful tool in comics – to make it engaging and also give another layer of meaning. It’s another way to understand abstract concepts. Chapter 2 is titled “Therapy,” but it’s also about diagnosis and misdiagnosis and mood disorders and I think you explained a lot of this better than almost anything I’ve read. This is very complicated. 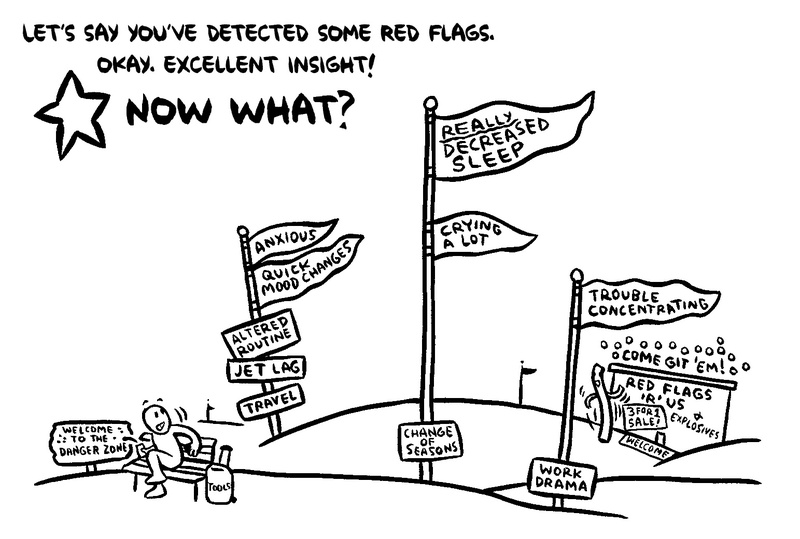 I think that the idea of misdiagnosis is an important one. Especially with the health care system the way it is now where doctors have like fifteen minutes to ask how are you eating, how are you sleeping, are you feeling down? Diagnoses are happening very quickly and without the depth of knowledge that really needs to come with a big thing like a diagnosis. Not only a diagnosis, but with direct treatment and the kind of meds that almost inevitably get prescribed. It’s a serious thing to go on psych meds. It’s really a difficult issue. One of the things that I really tried to straddle in Rock Steady is dealing with meds. Some of us need to be on meds indefinitely. For me, I would guess probably indefinitely. Some people need meds briefly or for a limited period of time in order to get out of the hole in order to get back on their feet and maybe they don’t need to be on meds indefinitely. For some people maybe there is some other kind of therapy or life change that would help them stabilize and maybe they don’t need meds at all. I don’t know that that range is given as much consideration as I think would be best. Meds are serious. They come with a lot of side effects. A lot of them are expensive. A lot of people for really good reasons just don’t want to be on meds. A lot of people don’t like taking things for even headaches. It’s nice to feel like you have a grip on what your body is doing and how to steer that. It’s one of the reasons why through Rock Steady I said, be sure to take your meds, if that’s part of your treatment. That notion of being healthy and stable is at the heart of both of these books. What does it look like and what does it mean and not resist it because of this idea we have about what life is. One of the big points in Marbles was that you don’t have to have this passionate, gritty, unstable life in order to do good work. You can be stable and take care of yourself and seek balance and be creative. That was the big revelation in Marbles. I would say that one of the things that is important to me in Rock Steady is “do your thing.” I was working with a psychiatrist as a consultant and my reader for Rock Steady. She read different drafts of the manuscript just to make sure that it made sense and was relevant and that I was using the right terms. One of the things I remember that she really liked that I had written was “do your thing.” It’s so important to remember that you’re not just a pile of symptoms and you’re not just a list of things that you should do to be healthy, but you’re you. That’s really important. It’s important for you to be yourself and to feel like yourself. That might mean doing things that aren’t optimal. For instance, one of the things that I say is that probably the most important thing to be healthy is to get enough sleep. Good sleep, regular sleep. If you have a lot of value in traveling the world, you’re going to challenge that over and over with jetlag and with non-routine. “Do your thing” means figuring out how to do that. I think that’s the other side of it’s okay to be stable – it’s okay to prioritize who it feels like you are. It can be a funny balance, but that’s what it’s all about, balancing. When first adjusting it can feel like there’s a lot that needs to be sacrificed and there was so much that I felt like I had to give up in order to be stable. And again in Marbles it was realizing that I was gaining things that I valued. [laughs] Thank you for that. I’m glad. I put so many details in the book for people who pay attention and one of the greatest things about getting your work out there is to hear what people notice or react to. I wanted to include that because I thought that quote made so much sense, but it felt kind of pompous. Especially the “violent” part of it. Here I am making this big heavy statement and essentially what I’m saying is, if you have a strong rhythm section you can do as much crazy jazz on top of that as you want. I needed to take the quote down a notch and make it funny. How I came up with it was just as absurd and abstract as you interpreted it, so perfect. Marbles was your first longform book and that was a big part of the challenge of the book. What was making Rock Steady like? Was it easier? It’s hard to say because the process was so different. Rock Steady was a ton of work. I love doing research and so I loved doing that. Part of the difficulty was the same thing that everybody runs into in the internet, you find something fascinating and then you go to the next citation and then you wind up going into something in way more depth than you had originally intended. Organizing everything was challenging. Figuring out how to organize it in a way that’s useful was really, really important to me. That sounds like maybe an obvious statement, but there are a lot of guides and manuals and texts that we’ve all been frustrated by because it is difficult to find information in them. I wanted to make sure that it be organized in a number of different ways. A lot of people told me that Marbles was easier to read than any of the other memoirs or collections of information that they could get ahold of. Partly because of the comics format. Some of it is the openness of it, some of it is the language of comics. We all have emotions and we all have anxiety and there are a lot of coping tools in here that are for anyone, but basically the book is for people who are in distress. 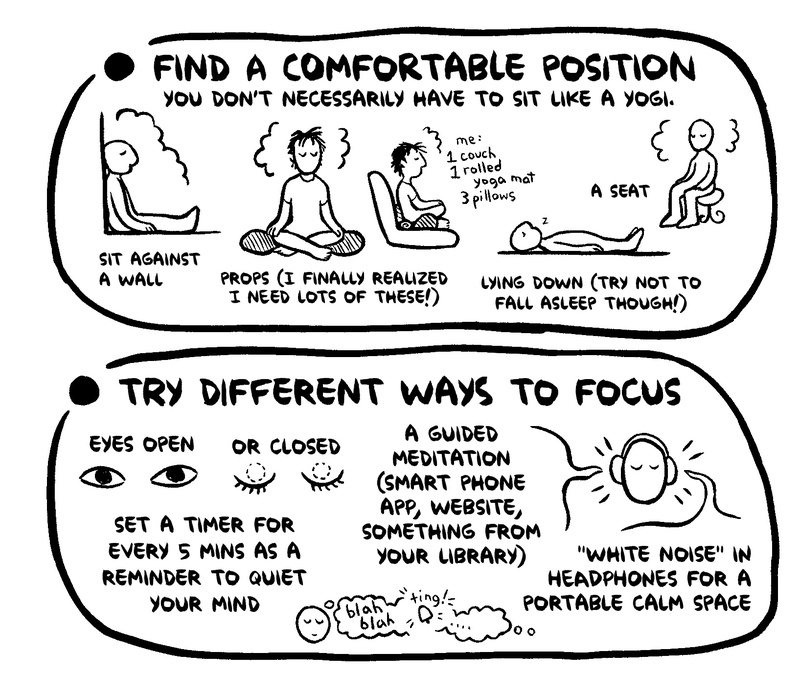 If you have a mood disorder and you’re in distress, it can be really difficult to focus and find the things that you need. To have all of these different paths to getting to where you need was really important to me. I said earlier that the big challenge of the book is that this isn’t inherently visual, but the organization is the other challenge. Of course you start with the basics, with diagnosis, but after that you could take it in any direction. You just said, of course it’s set up that way, but it’s not of course. There was one other manual by two women and the very first chapter is about meds and that those daily med containers are really handy and you should really have one. That’s what they started with. So there isn’t really any set progression. In that the design isn’t visible, I appreciate that. If it flows out naturally, that’s great, because there’s a zillion ways you could organize it. There is no arc, so it’s up to you to find a way to organize it. Exactly. That was the arc that I created. Starting out with the basics and flowing through them and ending with you’re not alone. I could have started with you’re not alone. Hey, you’re getting in here we’re all getting in here and let’s go. This is just the way that made sense to me. Ending with “You Have Company” made sense to me because the book covers therapy and medication and finding a way to balance your life. This process takes time and it doesn’t end. Pretty much anyone can change their life for six months and do whatever it takes to get better. But after doing that for a year or five years, you need something else. Exactly. What does ten years or twenty years look like? The you are not alone part is interesting it’s complicated because there are two different things going on there. One, I’m emphasizing through the book as much as I can that you need to come up with what works for you. Different things work for different people and having a wide variety of coping tools to chose from will really be the tact that will serve you personally. At the same time I’m saying that you’re not alone and we’re all on a team and we’re all in it together. I’m saying you’re an individual and you’re part of a group at the same time. Clearly they’re not mutually exclusively but keeping a grip on both of those things can be challenging. You have your own story and you have your own symptoms and just because you’re not experiencing mania like I experience it doesn’t mean that your way of experiencing it isn’t right. Just because some tool works for me doesn’t mean it will work that way for you. You’ll have your individual thing but that doesn’t mean that you’re not part of a bunch of people who understand. You’ve been involved in graphic medicine for a few years now and it has become accepted by a lot of people in the medical community. Why do you think it’s been embraced? 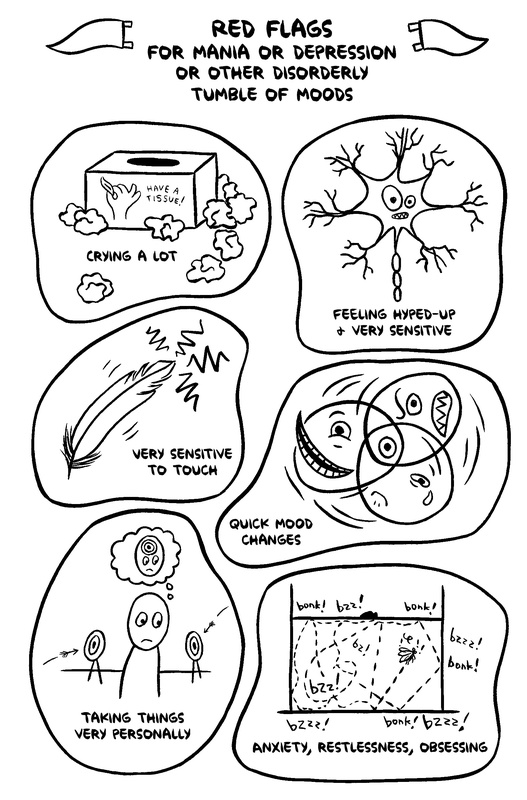 A lot of graphic medicine is memoir, but it’s not all memoir. Most of the graphic medicine is from one creator. You’re getting their drawings and words. It’s generally hand written. There’s a certain intimacy in that. Especially when telling personal stories. It’s not just a pamphlet of information, it’s somebody telling you a story. A story is the most effective way to get information, really, as humans. How we can learn from other people’s experiences as a way to learn about health, not getting third person information but actually hearing about someone who has gone through it. The impact that that allows. I think it still has a little ways to go to get really accepted by the medical establishment. It’s happening. I know that it’s infiltrating.